I don’t know why everything has to be so difficult! The emotions you feel when a loved one has passed are intense and raw, but the business dealing with a loved one’s affairs should not be even MORE difficult. I am so upset… actually pissed with insensitive people. This world is full of people who simply do not care, and they make this world dark and depressing. Our world is already pretty bleak, while our family grieves… I simply do not understand why these rude, self-centered people do not realize how they affect others. Friday morning, I crumbled. Yes, I sat at my desk and sobbed and sobbed, when I finally finished I had the red puffy eyes that ached when I closed them. I remember crumbling like this, right before the service- literally minutes before we were walking into the church. Throughout all of this, I have been pretty strong, all things considered. However, when it hits me, it really HITS me. Crumbling describes it perfectly, because that’s how it feels. No matter how hard I try, I cannot compose myself. Don’t get me wrong, we are surrounded by people who care, friends & family who love and support us. Even at work, I am lucky to have friends who care. I see the tears in their eyes as I describe my frustration and anger as they empathize with me while I talk about dealing with these horribly rude people. I am not naive and know that the world is full of people who simply do not care about others or their plight. I do not expect to be handled with kid gloves while pumping gas, buying groceries, or any of the other million daily tasks. However, if we are presenting you with a death certificate or discussing our loved one’s passing, I do expect a little compassion, sensitivity or at the very least, do NOT be a jerk! Friday, I hit my limit on jerks and responded with untamed waterworks. I have made a few hats for babies in the NICU since December 27th, however, I hope to make more just to show that there are people out there that care. These horribly mean, uncaring people are my new inspiration to make a difference, to counterbalance kindness and love for the rude and mean. 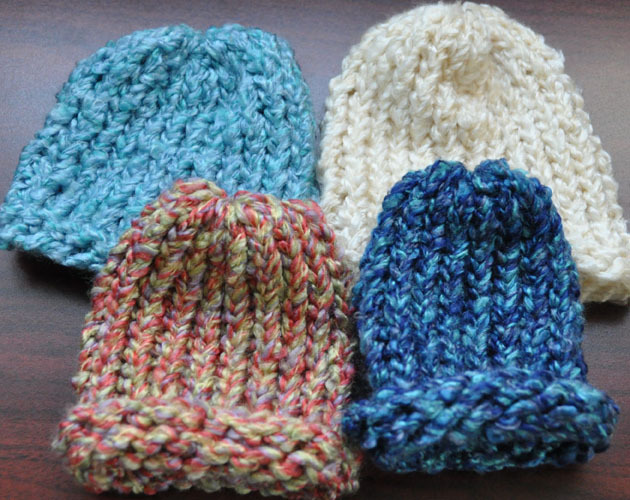 Here are just 4 hats I made since 12/27, but like I said I am on a mission to make more. On Friday, just as all the emotions were hitting me, I received an email from Teresa, a friend we met through this loom-knitting for charity cause. She sent me a poem that was very insightful and has me going back to it almost daily. The poem and her friendship touched me and I appreciate her immensely.